China's longstanding one-child policy, introduced in the late 1970s by the government to combat social and economic problems associated with the country's high population rate, isn't so popular right now, partially because some local government officials, who are rewarded or penalized depending on how well they keep the birthrate down, are kidnapping pregnant women and forcing them to have abortions. Shocking how more people aren't behind that solution, isn't it? Pan Chunyan was grabbed from her grocery store when she was almost eight months pregnant with her third child. Men working for a local official locked her up with two other women, and four days later brought her to a hospital and forced her to put her thumbprint on a document saying she had agreed to an abortion. A nurse injected her with a drug. "After I got the shot, all the thugs disappeared," Ms. Pan, 31, said in a telephone interview from her home in the southeastern province of Fujian. "My family was with me again. I cried and hoped the baby would survive." But after hours of labor, the baby was born dead on April 8, "black and blue all over," Ms. Pan said. Stories like Chunyan's are spreading on local blogs and in state-run newspapers, reigniting a debate over the one-child policy, which some policy advisers and scholars say isn't even good for the country right now. "An aging working population is resulting in a labor shortage, a less innovative and less energetic economy, and a more difficult path to industrial upgrading," demographics analyst He Yafu told the New York Times. Economists estimate that there will be 411 million 60+ Chinese citizens in 2040, up from 171 million today. That would drop the working population (people between the ages of 20 and 60) to 696 million from 817 million. And scholars say families don't even want to have tons of kids anymore — thanks to the economy and a mass move towards urban areas, who can afford more than a few children? Not many families. So why won't the government reconsider the law? 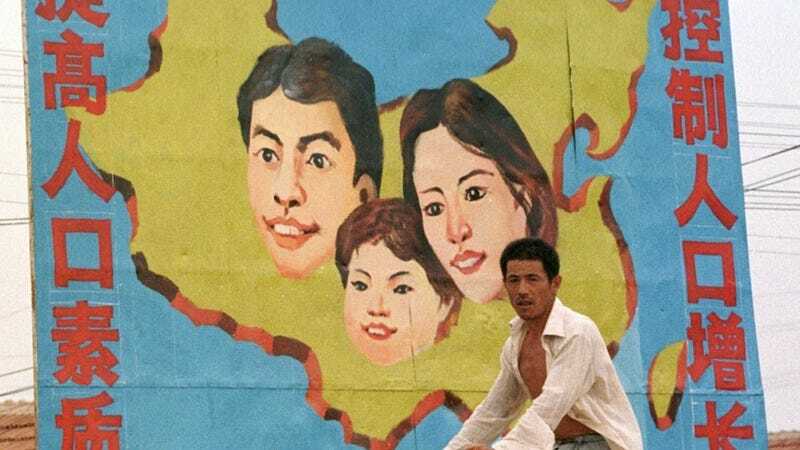 According to the 2010 national census, the average birthrate for a Chinese household is 1.181; it's lower in cities and higher in rural areas. There are around 22 ways in which parents can get around the one-child rule — rural couples and ethnic minorities are allowed to have more kids, for example — but the brilliant "how about we just kidnap a woman and force her to terminate her pregnancy" strategy is actually more of an issue in rural areas, where families are sometimes allowed to have two children but more means officials have to take action or risk getting punished for failing to keep down the population. Experts say the strict quota "remains among the so-called one-veto criteria for promotion and is about as significant a goal as maintaining stability or growing the local economy," and that the orders come from higher up in the government. Even when parents are ready to pay the $7,200 fine a third child warrants, officials will pressure or force mothers to have abortions to make sure "targets are met." Chunyan told the Times that she and her husband gave the head of their township's family planning commission the money he demanded but he still had her kidnapped from the market to make sure those targets were met. She also said they was seeking legal representation, but the Times reports that neither Chunyan nor her husband have answered their cellphones over the past week, "raising suspicions that officials from Daji may have intimidated them." While economists, political advisers, scholars, and those who believe in the basic human right to have control over your own body all agree that the one-child policy should be abolished, China's government doesn't show any signs of wavering on the issue. The National Family Planning Commission posted a statement online after a semiannual work conference last week "that praised the policy as having helped avoid 400 million births since it was put in place in 1980." Avoiding births, one grocery store kidnapping at a time.